High Groves is a 400-acre estate, approximately ¼ of which is mature orchards and vineyard, encircled by a lush private forest. A natural bowl in shape, extending to the tops of the surrounding mountains, High Groves offers a unique combination of luxury and rustic countryside making it a magnificent retreat destination. There is theatre onsite for power point presentations or to indulge in movie night. There is plenty of common space inside the manor for relaxing, however every view outside is spectacular and guests will not want to miss star gazing opportunities at High Groves. Meals are vegetarian and chef prepared, with comfortable dining areas both inside and outside. 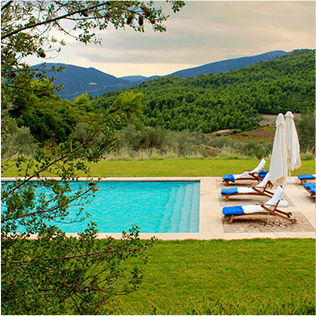 High Groves is an experience of rustic elegance that will restore your health and sense of well- being, as you see a side of Hellas that is reserved only for the privileged few. The rooms are decorated with simple elegance. The feel of the manor is simple and spacious yet cozy, and there are many places to relax as a group or to find a quiet corner. Each window of the manor boasts its own unique and spectacular view of the surrounding area. Single, double and triple occupancy are available. High Groves Previous Yoga Shala Next The Yoga Space is designed to reign in the elements of Zen with a coconut carpet, dimmed lighting, simple art of the Buddhist origins and a spectacular view that overlooks the cliff side and mountain sunsets beyond. The space comfortably fits up to 20 yogis, which makes High Groves a perfect setting for a weeklong retreat. Although High Groves is situated in an area of Greece heaping with historical and adventurous explorations, you do not necessarily need to leave the property in search of wonderful activities. High Groves Estate offers a beautiful swimming pool, a home movie theater and game room as well as many places to cozy up with a good book or a cup of tea. The property offers plentiful opportunities for walking and/or hiking and many an adventure can be found simply getting to know the orchards and the animals. 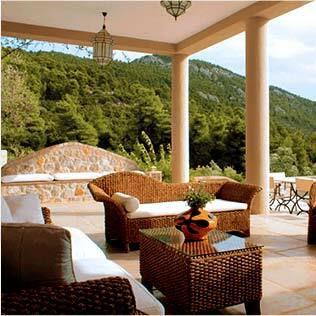 Accessibility to the sea, to Athens and to many of Greece's most important ancient sites including the Theatres and Asclepion of Epidaurus, Mycenae, Tyrinth, Corinth, Argos, Nemea and the Palamidi of Nauplio, make High Groves a very special place to hold a retreat. If you happen to be interested in the culture and history of the area, then world heritage monuments are a stone's throw away. The world-famous attractions of Argolis (Epidaurus, Mycenae, Tiryns, Nafplion, Corinth) and Athens are near. Day trips to Olympia, Delphi, Poros, Hydra and Spetses are possible, too. Dive into the local flare in the nearby village, which includes small shops, bakeries and seaside walking paths. A visit to the local amphitheater, dating back to 4th BC is an easy ten-minute stroll away through orange groves and olive trees. For the those seeking to go deeper, the most famous Padi diving center in Peloponnese, is located right next door Epidive Center specializes in training programs as well as archeological dives. Snorkeling is also available. 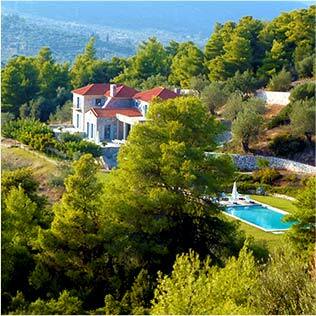 Epidavros is approximately one and a half hours from Athens International Airport. We can help you to arrange transportation to the property at various price levels depending on your group's needs.